This 2-carat diamond ring is stacked with over 2 carats of dazzling white diamonds, the Bowery bubble ring design captivates with an impressive display of natural diamonds held within an exceptional bubble ring design. 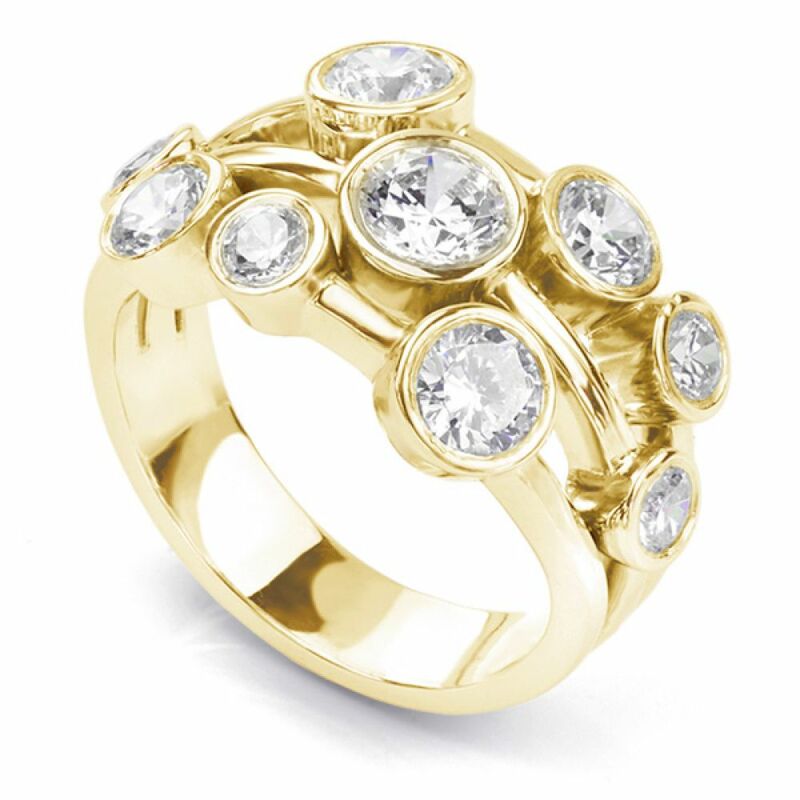 The Bowery Diamond bubble ring displays signature styling, set with a bold and impressive 2 carats of Diamonds. At the heart of this ring, a dazzling 0.50cts certified Diamond, features with beautiful whiteness (G Colour) and SI1 Clarity. Surrounding the main Diamond are varying sizes including 2 x 0.30cts Diamonds (4.5mm), 2 x 0.25cts (4mm) Diamonds and 4 x 3mm (0.10cts) Diamonds, held within full bezel settings, across a three band design. The ring design widens to 13mm above the finger, narrowing to 4.5mm below the finger, styled with the distinctive triple band effect, but adjoined as a single ring. The height of the ring reaches 4mm from the finger. Substantially crafted, this design is created in three separate parts to enable a complete finish between each band of the ring. We create your ring over 4 weeks through a process of time-honoured craftsmanship, meticulously hand finishing the final ring ahead of secure delivery. All commissions arrive delightfully packaged in our bespoke presentation box, hand-delivered to your door, with worldwide delivery available. At Serendipity Diamonds, we work with the most trusted diamond grading laboratories. In addition, we assure all of our clients across Canada of a minimum VERY GOOD cut grade. In addition, we will never supply any certified diamond with higher than nil or slight fluorescence for your total reassurance. Use the link below to ask for your free ring sizer. Our easy to use sizer ties around the finger and gives you the UK size. Alternatively contact us with your local size reference and we'll work to this for you. All Canadian clients receive a free ring sizer sent by First Class Airmail. We will even confirm that this is on its way to you. Are you in need of guidance? Our friendly team are always on hand to offer expert guidance on all of our engagement rings including bespoke design. We will always do our very best to answer any questions. Owing to time differences with Canada, please feel free to contact us through our message system or email us. Alternatively, use our online contact form. On arrival - what to expect when your parcel arrives. All deliveries to Canada arrive by FEDEX. When your parcel touches down in Canada, all duty and taxes have been included within your engagement ring purchase to ensure that there are no complications when arriving. Your parcel will arrive in a sturdy outer wrap, containing a rigid inner jewellery box, beautifully packaged to include a document wallet with insurance valuation and diamond certificate (where applicable) presentation box and a complimentary proposal pocket box. View a selection of diamond sizes on the finger. Our handy diamond size tool allows you to view diamond shapes and sizes to see how large they appear on the hand. Select your chosen shape, carat weight and skin tone and discover the mm. size of your diamond. All clients in Canada benefit from FEDEX signed for delivery, with engagement rings arriving beautifully presented in luxurious packaging. Across Canada, all clients benefit from the help of our small team of friendly jewellery experts. We have been shipping to Canada since 2007 and now have a large client base across Canada in areas including Alberta, British Columbia, Manitoba, New Brunswick, Newfoundland, Northwest Territories, Nova Scotia, Nunavut, Ontario, Prince Edward Island, Quebec, Saskatchewan and Yukon. We offer the same 60 days returns, lifetime warranty, free size adjustment and lifelong commitment to client care as we provide for all clients, regardless of location. We are also registered retailers for CanadaMark diamonds, mined in the Ekati and Diavik regions of Canada. For coloured gemstones we work with responsibly sourced natural pink sapphires, blue sapphires, emeralds and rubies. What cut grade can you expect from your diamond? Rough diamonds mined in Canada are typically sent to cutters in India and China to be faceted, before they are sent to laboratories worldwide for diamond grading. We buy selectively from some of the World's largest cutters and polishers, choosing diamonds that meet a very good cut grade as standard. Many of our optional CanadaMark diamonds are fully traceable and we are happy to supply diamonds with an excellent cut, polish and symmetry grade upon request. Service rating : From my first contact with them, they couldn't have been more helpful. I was kept up to date with the progress of my order from the start to when it was delivered. 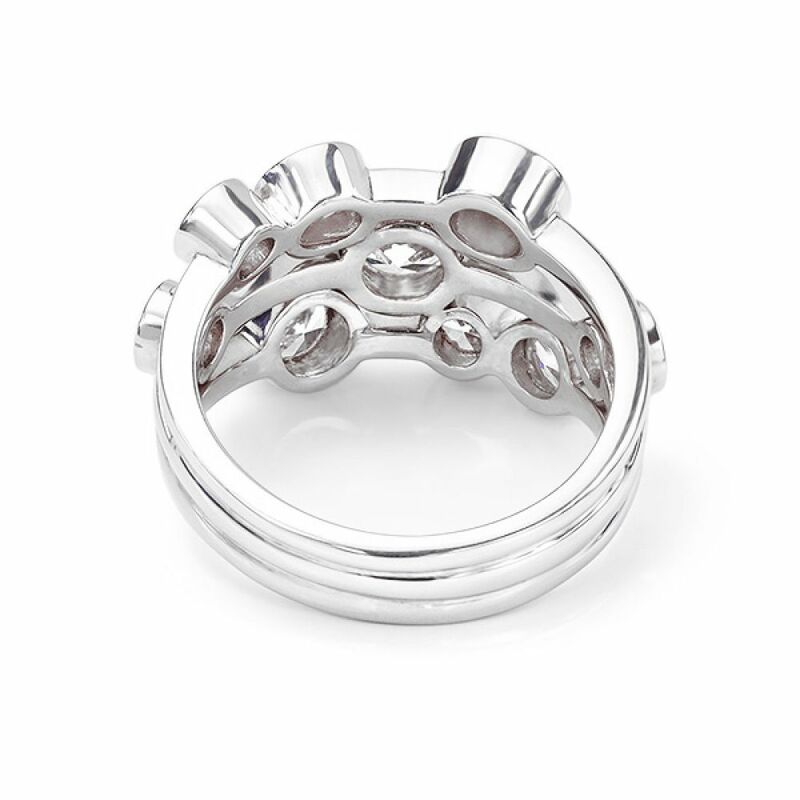 Product : The ring is exactly what I was looking for and I love it! © Copyright Serendipity Diamonds 2019 v2.0.11 Website by Toru Interactive Ltd.
Service rating : Fab company to order from! I ordered a ring with engraving on it and they were really helpful and kept in contact with me throughout the process from start to finish! The ring arrived and it was exactly what I was looking for!! Service rating : Highly recommended - thank you. Product : This was an identical replacement to one lost. Very impressed. Service rating : Excellent service, they spent a lot of time listening to our requirements, suggested options, and guided us through the buying process. Service rating : I was very pleased with the friendly first Class service that I revived . Product : I was very pleased with the friendly first class service that I received. Service rating : I would highly recommend Serendipity Diamonds. I received a wonderful service from the staff in the store and I received regular updates on my purchase. Product : The ring is stunning and fits beautifully. Service rating : Fantastic experience from start to finish..
Everyone I spoke to was very helpful. I was recommended by a friend, and I highly recommend anyone to use this great company. Service rating : Totally exceeded my expectations from the start. I was nervous ordering online without seeing the product but had nothing to worry about. Emily was fantastic, and communication was great throughout. thankyou. Service rating : Excellent customer service and quality of products. Definitely recommend it. Anonymous Service rating : Thank you Victor, for taking the time to leave us a review, this is very much appreciated.